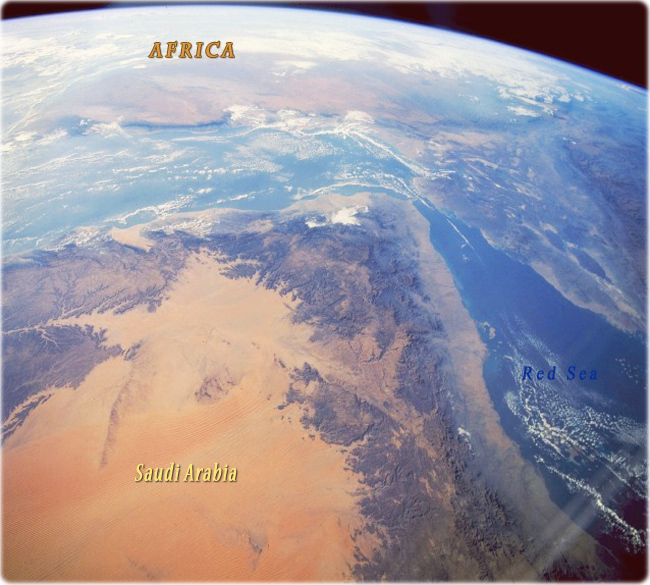 Saudi Arabia and Yemen (NASA, December 1993) This south-southwest-looking photograph shows the southwestern Arabian Peninsula, the Gulf of Aden, the Red Sea, northern Somalia, the Afar Triangle and the Great Rift Valley of Ethiopia. The southwestern Arabian Peninsula, most of which is in Yemen, has a narrow coastal plain (Tihamah) along the Red Sea about 30 to 80 km wide, interior highlands, and mountains that descend to a great sandy desert. The coastal plain is hot and virtually rainless with high humidity, alluvium and talus carried down from the highlands, and little vegetation cover. The interior highlands, a section of the uplifted Arabian Plateau rising more than 660 meters, annually receive an average of 50 cm of precipitation, most falling between the months of June and September. This area is the wettest part of the Arabian Peninsula with numerous valleys and watercourses. Wadi Hadhramaut (east of center) is the largest. The upper and middle highlands, Yemen’s best farmlands, have alluvial soils and moisture from intermittent streams; the lower portions are uninhabited and extremely dry. The eastern and northern highlands, which are in the rain shadow, slope down into the great sandy expanse of the reddish southwestern Rub’ al Khali Desert with parallel northeast-southwest trending sand dunes. West and southwest of the Arabian Peninsula and the Red Sea is the Danakil Depression, part of the Great African Rift Valley; south of the peninsula, scattered clouds cover portions of the Gulf of Aden and the coastal ranges of northern Somalia. Copyright © Geographic Guide Globe Images from Planet Earth, Image of Asia.